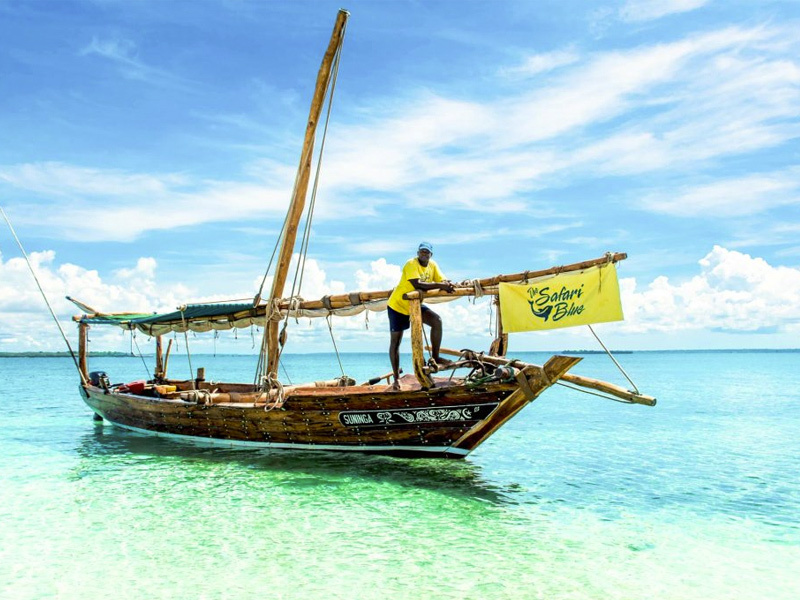 Zanzibar’s most talked about Sea Adventure ! 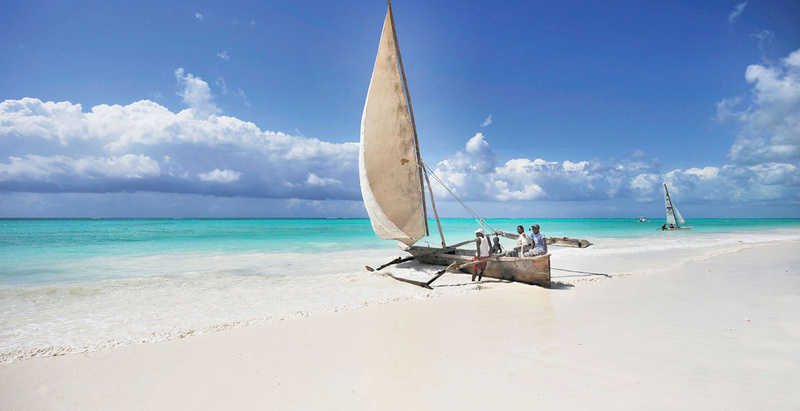 Zanzibar has to offer, while making a positive difference to Zanzibar and its people. We are the original Safari Blue operator and the only one fully licensed and registered. Our huge success has sparked a fleet of copycat boats and operators, but they are just that. We are the only genuine Safari Blue; we are professionals with years of experience and we are passionate about our product. English, Italian, French, Spanish and Portuguese. Safari Blue is owned and personally managed by Eleanor Griplas. She believes in creating worthwhile, sustainable employment and training. She doesn’t stop with Safari Blue. 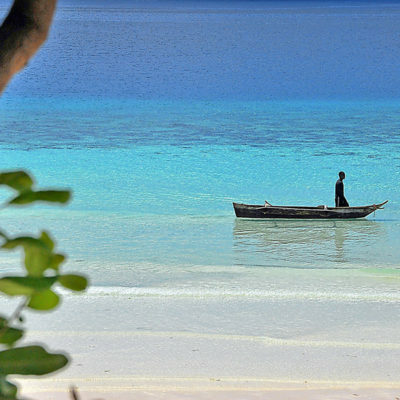 Eleanor is well-known and respected throughout Zanzibar. She contributes by supporting local schools and providing student sponsorships, outings for children and patients, infrastructure improvements in Fumba, construc-tion and maintenance of a mosque, and is an active member of the local Rotary Club raising money for local causes. Please bring a beach towel from the hotel and wear a swimsuit under your clothes. Suitable beach footwear is suggested as well as sunglasses, wide brim hat, a t-shirt to snorkel in, motion sickness tablets (if you don’t have your sea-legs and lashings of sunscreen. 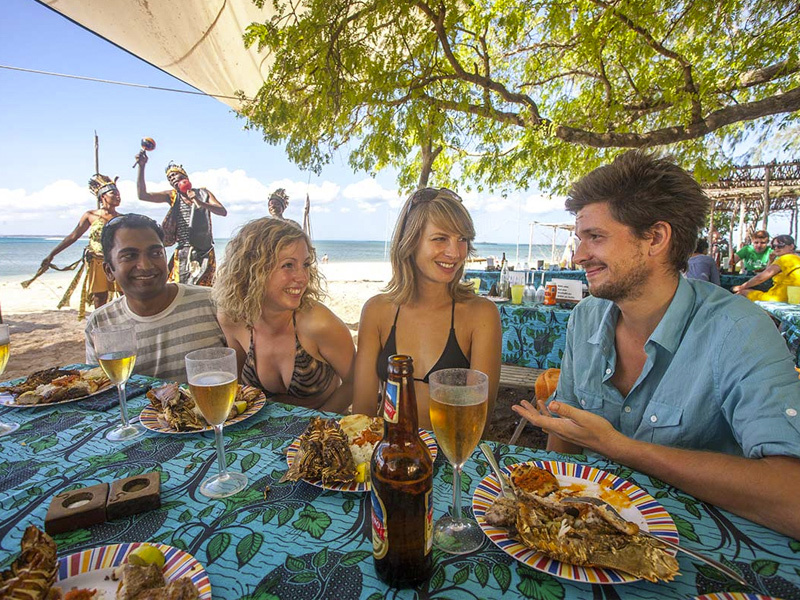 Your Safari Blue Experience begins in the little fishing village of Fumba, just 30 minutes from Stone Town. From here set out to sea into the Menai Bay where conservation efforts have allowed dolphins to flourish. 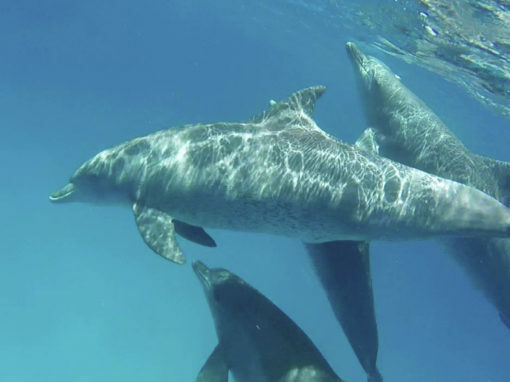 Dolphins are spotted on 90% of Safari Blue’s trips. 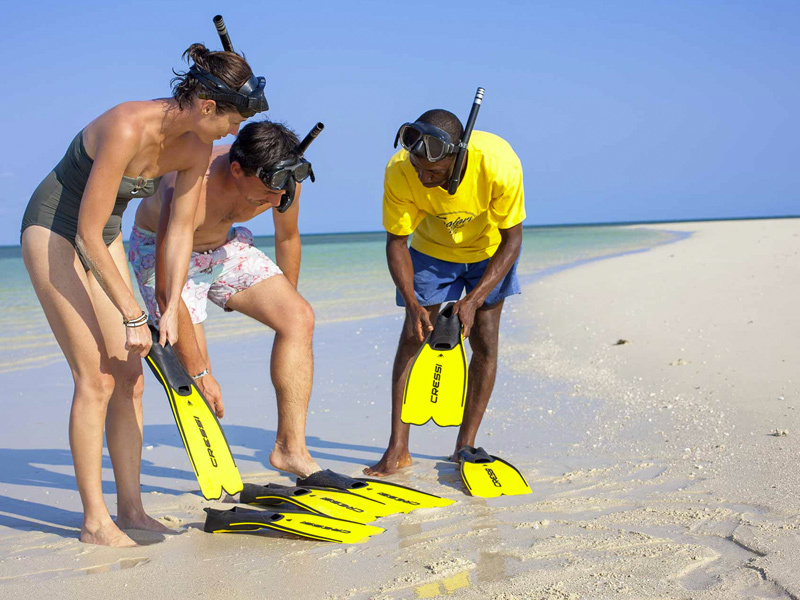 We land on a powdery sandbank where we set up sunshades and fit you with snorkel gear. 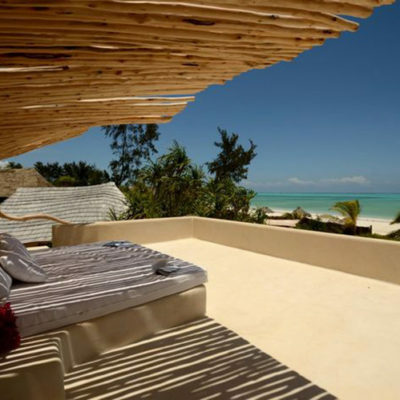 From here enjoy frolicking in the shallows or bask in the sun under the clear Zanzibari sky. 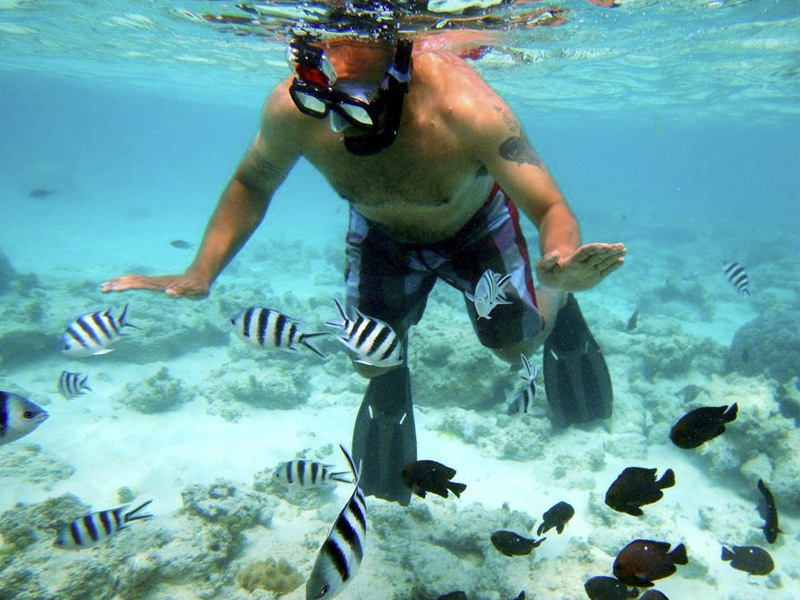 We snorkel over two different reefs in the morning, both locations offering a variety of pris-tine marine life. Take advantage of our crew’s expertise as they guide you to the best viewing spots. Our Kwale Island restaurant is ready and waiting for your arrival. Feast on our famous fresh seafood buffet. Drinks are abundantly served throughout the day. Safari Blue’s secluded is-land ‘restaurant’ is set up with brightly decorated tables under the shade of tamarind trees. 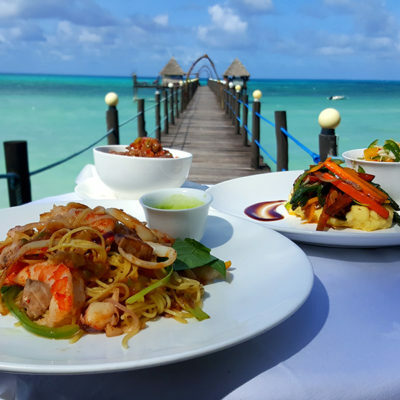 Feast on the famous Safari Blue traditional Zanzibari seafood buffet including slipper lobster, grilled fish, calamari, chicken, rice, Spice Island tomato sauces… and more. Enjoy fresh fruit juice, beer and soda. Eat and drink as much as you like! A gastronomic fruit tasting follows with a selection of between 10 to 15 different tropical fruits prepared at your table. Coffee and Amarula liqueur are also served after lunch. On Safari Blue there are no hidden extras to pay for – everything is included. Chakula Chema! Discover all that Kwale island has to offer. Sail on a traditional Ngalawa canoe, explore the mangroves, climb an ancient baobab, witness the coral formations, swim or lounge the after-noon away on a day-bed or the beach. When the day is done, the crew hoists the lateen sail as you make a leisurely voyage back to Fumba as the sun sets on your glorious day in paradise.